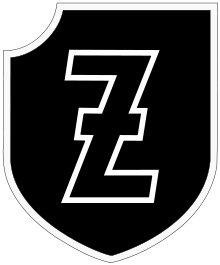 The 4th SS Polizei Panzergrenadier Division (4. SS-Polizei-Panzergrenadier-Division) was one of the thirty-eight divisions fielded as part of the Waffen-SS during World War II. The division was formed in 1939 as part of the Ordnungspolizei or Orpo (uniformed national police). While all German police organizations were controlled by Reichsführer-SS Heinrich Himmler in his capacity as Chief of German Police in the Interior Ministry, they were not at this time considered part of the SS, nor was the Polizei Division on par with the other Waffen-SS divisions. This status was reflected in the quality of the equipment they were issued and their retention of police insignia and rank structure. The division was transferred to the Waffen-SS in 1942 and was upgraded to a Panzergrenadier division. It fought in France, the Soviet Union, Greece (where it orchestrated the Distomo massacre) and Pomerania and surrendered to the Americans in May 1945. The division was formed in October 1939, when thousands of members of the Ordnungspolizei were drafted and placed together with artillery and signals units transferred from the army. These men were not enrolled in the SS and remained policemen, retaining their Orpo rank structure and insignia. They did not have to meet the racial requirements imposed for the SS. Himmler's purpose in forming the division was twofold: in a period of heated bureaucratic infighting and competition for manpower, it permitted him to get around the recruitment caps the Wehrmacht had succeeded in placing on the SS, it also provided a means for his policemen to satisfy their military obligation and avoid army conscription. The first commander was Generalleutnant der Polizei (Major-General) Karl Pfeffer-Wildenbruch, a career police commander who had been a general staff officer during World War I; simultaneous with his appointment he was also commissioned as an SS-Gruppenführer. The division was equipped largely with captured Czech materiel and underwent military training in the Black Forest combined with periods on internal security duties in Poland. The division, at this time an infantry formation with horse-drawn transport, was held in reserve with Army Group C in the Rhineland during the Battle of France until 9 June when it first saw combat during the crossing of the Aisne river and the Ardennes Canal. The division was engaged in heavy fighting and after securing its objectives, moved to the Argonne Forest, where it came into contact with the French and fought a number of actions with their rear guard. In late June 1940, the division was pulled out of combat and transferred to the reserve of Army Group North in East Prussia. In January 1941, administrative responsibility for the division passed from the police to the SS-Führungshauptamt (SS operations office), the materiel and training headquarters for the Waffen-SS; its personnel however, remained policemen, not members of the SS. During the invasion of the Soviet Union (Operation Barbarossa), the division was initially part of the reserve with Army Group North. In August 1941, the division saw action near Luga. During heavy fighting for the Luga bridgehead the division lost over 2,000 soldiers including the commander, Arthur Mülverstadt. After a series of failed attacks in swampy and wooded terrain, the division, along with army formations, fought its way into the northern part of Luga, encircling and destroying the Soviet defenders. In January 1942, the division was moved to the Volkhov River sector, and on 24 February it was transferred to the Waffen-SS; its personnel changing their police insignia to that of the SS. The formation was involved in heavy fighting between January and March which resulted in the destruction of the Soviet 2nd Shock Army. The remainder of the year was spent on the Leningrad front. In February 1943, the division saw action south of Lake Ladoga and was forced to withdraw to a new defensive line at Kolpino where it was successful in holding the Red Army, despite suffering heavy casualties. It was at this point that units of the division were transferred to the west to retrain and upgrade to a Panzergrenadier Division; leaving a small Kampfgruppe (battlegroup) in the east and a Dutch Volunteer Legion, the Niederland, to make up the numbers. The Kampfgruppe was disbanded in May 1943, when the SS-Polizei-Panzergrenadier Division was ready for action. The division was sent to Greece where it undertook anti-partisan operations in the northern part of the country. The division remained in Greece until August 1944 before being recalled to face the advancing Red Army at Belgrade. It was again involved in heavy fighting and suffered heavy losses. During its service in Greece, the division was involved in war crimes and atrocities against the civilian population, and had been under scrutiny by the Gestapo. In particular they were responsible for the Kleisoura massacre and the Distomo massacre; the latter being one of the worst atrocities committed by the Waffen-SS during World War II. On June 10, 1944, for over two hours, troops of the division under the command of SS-Hauptsturmführer Fritz Lautenbach went door to door and massacred Greek civilians as part of a "retaliation measure" for a partisan attack upon the unit. A total of 214 men, women and children were killed in Distomo, a small village near Delphi. According to survivors, SS men "bayoneted babies in their cribs, stabbed pregnant women, and beheaded the village priest." Elements of this division acting in retaliation, committed atrocities in the mountains of central Greece ("Ρούμελη") during May and June 1944 that resulted in the destruction of Sperchiada and the massacre of 28 civilians in Ipati. The division later participated in Operation Kreuzotter (5–31 August 1944), an attempt to eradicate ELAS bases from the same mountains which was a failure, but included the killing of 170 civilians and the partial or complete destruction of dozens of villages and cities. The much reduced SS-Polizei Division was moved to a front line north in Pomerania. Hitler assigned it to Army Detachment Steiner for the relief of Berlin. They were supposed to be part of the northern pincer that would meet the IV Panzer Army coming from the south and envelop the 1st Ukrainian Front before destroying it. Steiner explained to General Gotthard Heinrici, he did not have the divisions to perform this action and the troops lacked the heavy weapons needed, so the attack did not take place as Hitler had planned. Moved to Danzig, the SS-Polizei Division was encircled by the Red Army and was shipped across the Hela Peninsula to Swinemünde. After a brief rest, what remained of the division fought its way across the Elbe river, surrendering to the Americans near Wittenberge-Lenzen. ^ Dordanas, Stratos (20 Jan 2008). "Ο διαβόητος συνταγματάρχης Καρλ Σύμερς και τα αντίποινα του στρατού κατοχής εναντίον των "απείθαρχων" αμάχων στη Μακεδονία. Οι λίστες θανάτου των Ες Ες". Τα Νεα. Retrieved 28 Dec 2016. ^ "Greek Government response to ICJ Ruling" Embassy of Greece. ^ "Greeks lose Nazi massacre claim." 26 June 2003 BBC. ^ "Greeks lose Nazi massacre claim". BBC News. 2003-06-26. Retrieved 2009-02-26. ^ Barsos, Chronis (14 Aug 2015). "5-31 Αυγούστου 1944: Η μεγάλη γερμανική εκκαθαριστική επιχείρηση «Kreuzotter» (Έχιδνα) στην κεντρική Ρούμελη". www.mag24.gr (in Greek). Archived from the original on 6 Oct 2015. Retrieved 28 Dec 2016. ^ Beevor 2002, p. 248. ^ Beevor 2002, pp. 310–312. Beevor, Antony (2002). Berlin – The Downfall 1945. Viking-Penguin Books. ISBN 978-0-670-03041-5. This page was last edited on 9 January 2019, at 06:01 (UTC).